In the year 1680 the Westphalian half-timbered buidling was constructed. Early on it was used as a public house. The publican Heinrich Markmann is mentioned in a document to be the owner from 1764 until 1837. From 1950 until 1960 Eduard and Christel Burbaum hosted the restaurant. In 1960 Max and Mathile Burbaum carried on their work and in 1962 the house was family-owned. Eduard Burbaum jun. undertook the business in third generation. Enjoy the cultivated hospitality in the old Westphalian stlye, surrounded by the idyll of the 1000 years old St. Petrus church. 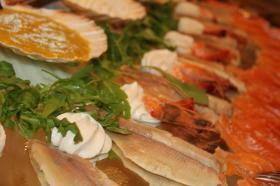 The restaurant offers an extraordinary atmosphere and room for 400 people. 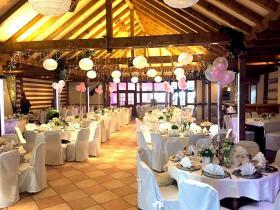 A highly flexible hall for every occasion, like eve-of-wedding-parties, birthdays and much more. 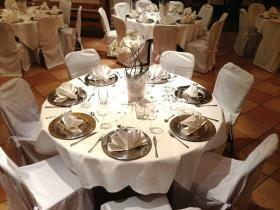 We also have suitable locations for weddings, work parties, meetings and conferences for up to 150 people. A table reservation or the booking of a menu/ offer is in the "Burbaums Restaurant" via GlobalGuest always for free you as a guest!